The passover seder is one way to rehearse the great story of liberation. It is celebratory and sensory: sight, sound, touch, smell, taste are exercised. Through it all, memories of what God has done in the past are retold. These prompt contemplation about what God is doing now and what God will do in the future. Thanks to all our friends from the faith community at Crossings Knoxville who participated last night. Thanks especially to Vicki who prepared and served a splendid table. The salad, lamb, veggies, potatoes, and brownies were just perfect. "You shall tell your child on that day, saying, ‘It is because of what the LORD did for me when I came out of Egypt’” (Exodus 13:8). The photos above were taken by Bible Land Explorer Chris Battle. If you are interested in exploring music, poetry, and pictures in the lands of the Bible email me at markziese@gmail.com or consider joining one of our excursions listed here. What is big, white, ornate and late? The “white synagogue” at Capernaum (Kfar Nahum or “house of Nahum”), Israel, is an oddity. It is constructed of imported limestone blocks that contrast brightly with the dark basalt stone used everywhere else. Its scale is monumental. It stands apart in a village dominated by small single-story residential homes. Several rooms in the synagogue are noted: a pillared hall, a patio, a balustrade, a small room, and possibly a balcony (?). The rooms were graced with ornate decorations on cornices, walls, and columns. These include geometric designs, stars, palm trees, and dedicatory inscriptions in Aramaic and Greek (as seen above). The synagogue was excavated and reconstructed at the beginning of the 20th century. It was dated by the excavators to the Byzantine period (4th or 5th century). At this time the little fishing village, famous from the Gospels, demonstrates social stratification and visible weath. This demonstration is a new thing; there is nothing like it from the known village of Jesus’s day. The synagogue of the 1st century remains hidden, perhaps beneath this big, white, late and ornate structure. Photograph by Bible Land Explorer Mark Kitts. 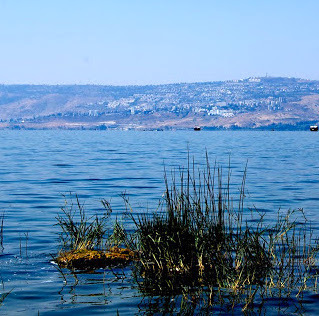 Interested in seeing Capernaum and the Sea of Galilee with your own eyes? Seats are available on three different study-tours scheduled for Israel/Palestine in the coming summer. Dates of travel are May 25-June 4, June 4-15, and June 26-July 7. The window for sign-ups is closing, so move with speed. Thirty years have passed since I took this picture of the excavations at Dan (Tell el-Qadi), Israel. Thirty years. This is where we spent the bulk of that season. It is adjacent to the “high place” and affectionately remembered as T-1. Running through T-1 (from bottom to top of this scanned slide) was the wall of an enormous building that was dated by Avraham Biran to the Assyrian period. 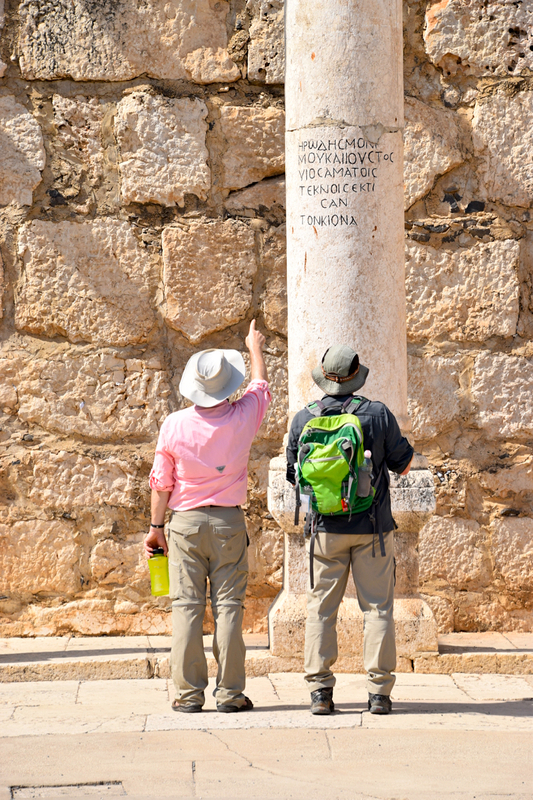 The northern face of the wall was marked by pilasters (the fella with the red shirt is leaning on one). Areas of flooring came to light, complete with smashed ceramic vessels. One jar, as I recall, was fairly intact. There was still cereal inside and the skeleton of a Iron Age mouse on top of the cereal. I trust his last meal was a good one. Oh my. At least the Chuck Taylors are still in style. There are gates a’plenty at Dan (Tell el-Qadi), Israel. This monumental gate complex is located on the southern edge of the ruin-mound. It is an enormous stonework construction integrated into the perimeter wall. It consists of four guardrooms flanking a central passage. Socket stones supporting swinging wooden doors are still visible in the threshold. A processional road climbs up the hill and into the city from the gate. The whole business was dated by the excavator to around the time of wicked King Ahab (9th century BC). “So the king got up and took his seat in the gateway. 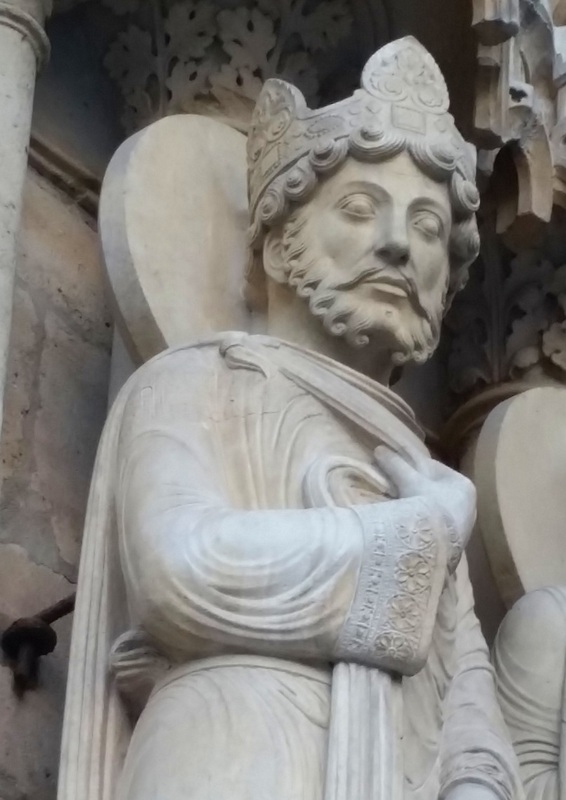 When the men were told, ‘The king is sitting in the gateway,’ they all came before him” (2 Samuel 19:8). A visit to Nazareth is incomplete without a stop at the Elbabour Mill. This stop is a delight to the eye, nose, and heart. The eye is excited by the colors. The nose is captured by the aroma of the earth’s natural flavors. The heart is warmed by the hospitality of our dear friends Tony and Jarjura. 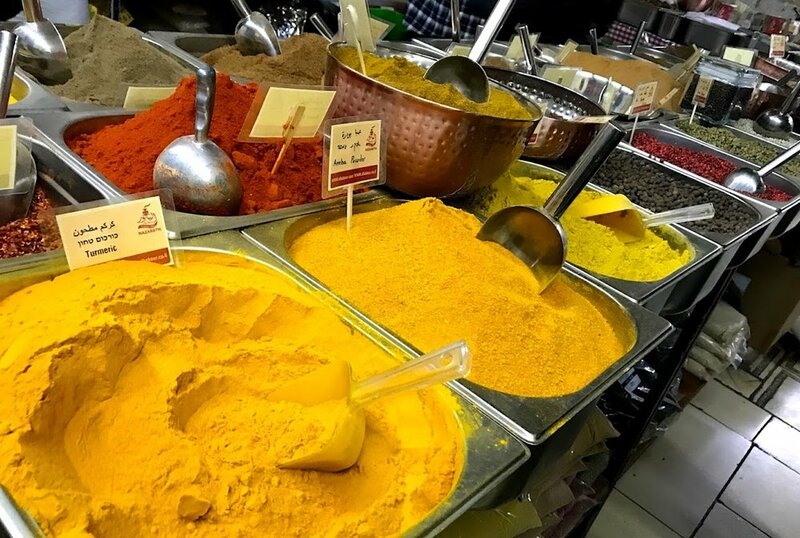 The mill is located in the center of Nazareth’s old market, not far from the community well. It has serviced the agricultural needs of the village since the Late Ottoman period. Its name, el babour, is a Arabic corruption of the phrase “the vapor” and refers to the steam engine that originally powered the mill. Photo by Bible Land Explorer Jessica Poettker. Tony Kanaza (far right) never fails to delight with stories of the mill, his latest culinary adventure, and his father. Read about this unique place in Nazareth’s history linked here. Interested in crafting an adventure of your own in the Land of the Bible? We work with church pastors, administrators, and college professors to customize trips to meet specific educational/ministerial needs. Shoot me a note at markziese@gmail.com to discuss possibilities or join one of the excursions listed here. This stronghold, resting on the flanks of Mt Hermon, protected the road to Damascus. It is known popularly as Nimrod’s Fortress or Qal'at al-Subeiba (“Cliff castle”). The site was hastily erected in the 1220s to prevent the European Crusaders from a return to the region. The fears were unfounded. The Crusaders did not return and despite the adaption of the latest technologies in this medieval slugfest between East and West, the fortress was never used as a point of active defense. I set our students free to explore the site on their own. Naturally the adventurous ones headed straight for the keep, the inner stronghold on the highest point of the ridge pictured here. We know that Saul of Tarsus was converted along the famous “road to Damascus,” but it is unknown where the event described in Acts 9 (see here) took place. For Bible readers the site of Magdala is forever linked to its most famous resident: Mary Magdalene. It is appropriate that the developers of this site on the edge of the Sea of Galilee built a spiritual center that is dedicated to the women who supported Jesus’s ministry. In the center of the building is a dome supported by columns. Inscribed on each column is the name of one of the women mentioned in the NT as a supporter of the ministry, e.g. Mary Magdalene, Joanna, Susanna, etc. One column in the array was left uninscribed. It provides our ladies with the opportunity to use their fingers to add their names to the list. They are a beautiful legacy, don’t you agree? The center at Magdala is named Duc In Altum. It draws its name from Luke 5:4 where Jesus instructs his followers to “launch into the deep.” Read the story here. 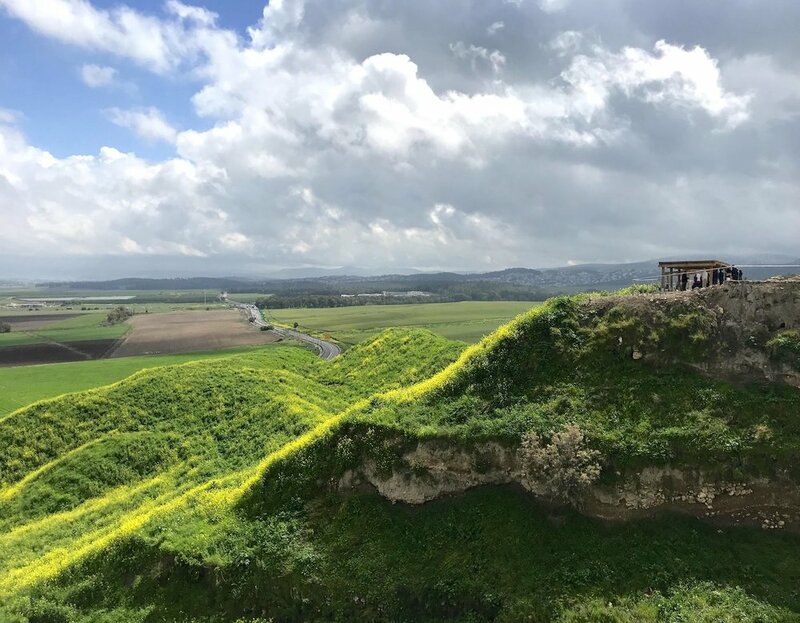 Tell al-Mutesellim (biblical Megiddo) turns iridescent when struck by the sun. The ruin-mound of approximately 26 cities has experienced many builders, winters, and excavators over the course of thousands of years. Pictured here is the eastern opening of a deep trench dug by Schumacher and the German Oriental Society at the beginning of the 20th century. Debris piles, also swathed in green, step down to the Jezreel Valley (Merj ibn-Amir) below. 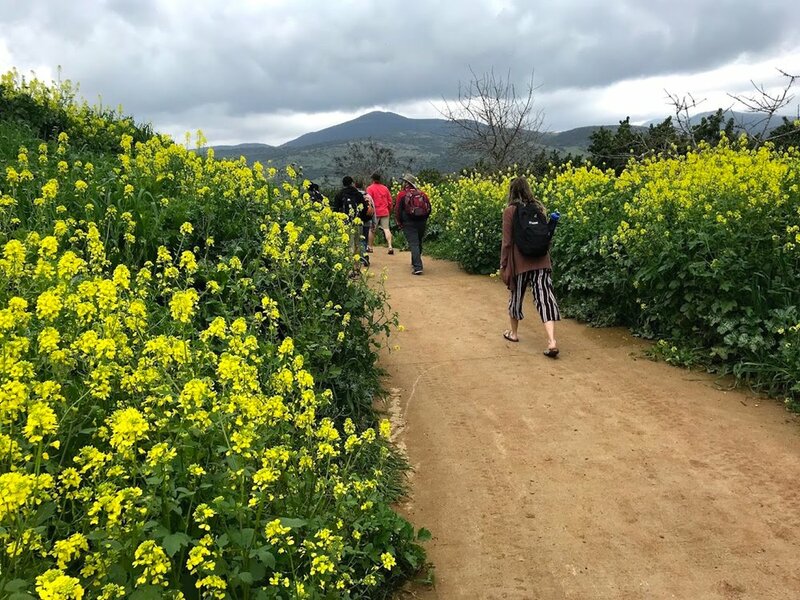 While rain-showers are possible in the Spring, these are lovely days to visit Israel/Palestine. Image by Bible Land Explorer Jess Poettker. Interested in crafting an adventure of your own in the Land of the Bible? We work with church pastors, administrators, and college professors to customize trips to meet specific educational/ministerial needs. Shoot me a note at markziese@gmail.com to discuss the possibility or consider joining one of our planned excursions listed here. 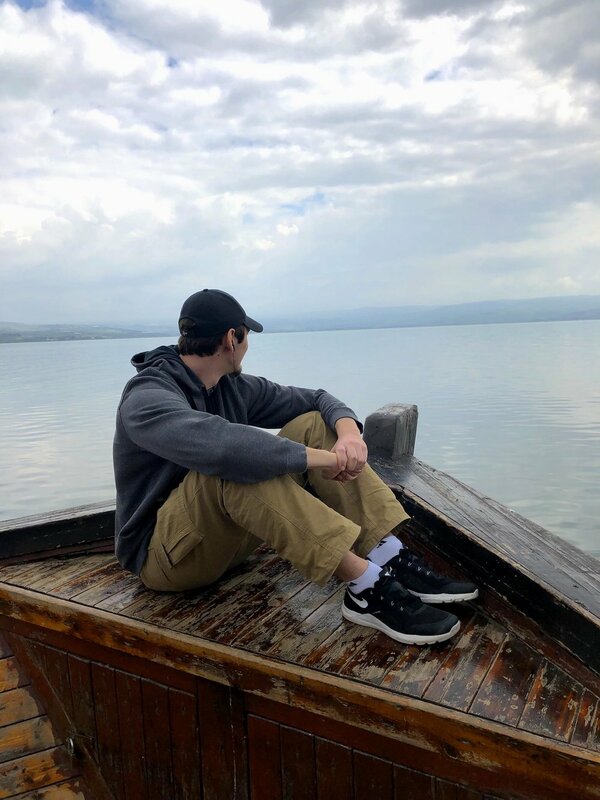 Nate enjoys the view from the bow of the Magen Avraham. The Magen Avraham is one of several boats that ply the Sea of Galilee. In the 17th century an important Polish rabbi was nicknamed “Magen Avraham.” His commentary on the Jewish Law was published posthumously and was given his nickname for a title. I’m not sure if our boat was named after the Genesis text, the rabbi, the book, the pirate ship or something else. It wasn’t flying the skull and crossbones. The next time I talk to Captain Tamer I’ll ask him. In the meantime, we’ll enjoy the view. *See the article in the Jerusalem Post by Gil Stern Zohar titled “Jewish Pirates of the Caribbean,” published 4/9/2016. Accessed here on 3/29/2019. Nate is a part of is a collaborative program involving between JU and local churches. He will graduate this May with a Master of Strategic Ministry degree. If you would like to have a “deep sea” adventure of your own, know that there are openings for trips departing this summer. Check the list of opportunities here. Visiting the Sea of Galilee (Kinneret) can make a fella hungry. So what do you do for lunch? St Peter’s fish and chips of course! People have been sharing meals like this on the seashore for millennia, but at no time as intensively as today. Excessive pressure has forced bans and limits on fishing in the Sea of Galilee. No worries though. Fish farms make up the lack and fill the plates. Of course, this means that the tilapia on your plate may have never splashed in the Sea of Galilee, ate a coin, or multiplied. See an interesting story here. Still, it is a pilgrim pleasure to be enjoyed. Have you tried it? Grilled or fried? What did you think? Photo by Bible Land Explorer Jess Pottker. These fish-eaters are part of the residency program of Johnson University. The program is a collaborative arrangement between Johnson University and local churches. The program leads to a Master of Strategic Ministry degree. 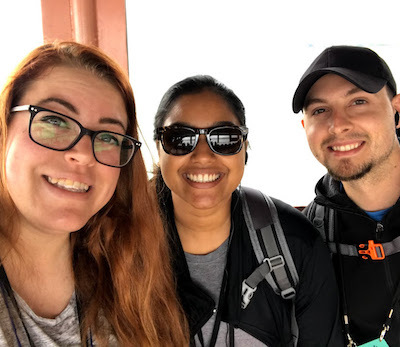 If you would like to have a fishy adventure of your own in the Land of the Bible, know that there are openings for trips departing this summer. Shoot me a note at markziese@gmail.com or check our full list of opportunities here. Why of course he has his own street! He is the patron saint of Bible Land Explorers of the 20th century. G. A. Smith’s Historical Geography of the Holy Land set the standard for biblical geographers. Read the 7th edition (1901) of his book here. We are packing our bags to come home, but Jerusalem is always on the horizon. 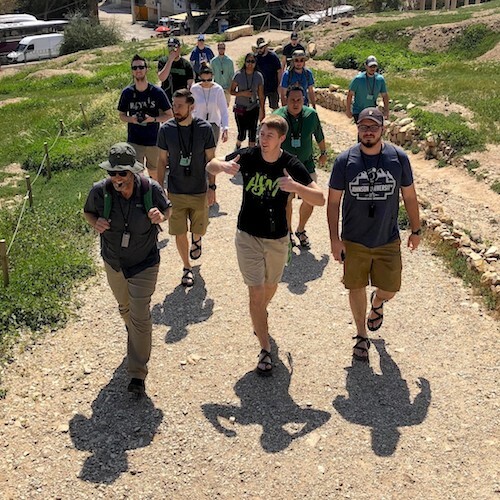 If you’d like to join us on an adventure of your own in the Land of the Bible, be aware that there are openings for Israel/Palestine trips departing this summer. Shoot me a note at markziese@gmail.com or see our full list of study-travel opportunities here. Jess, Seth, and Hunter pick their way through subterranean Jerusalem. 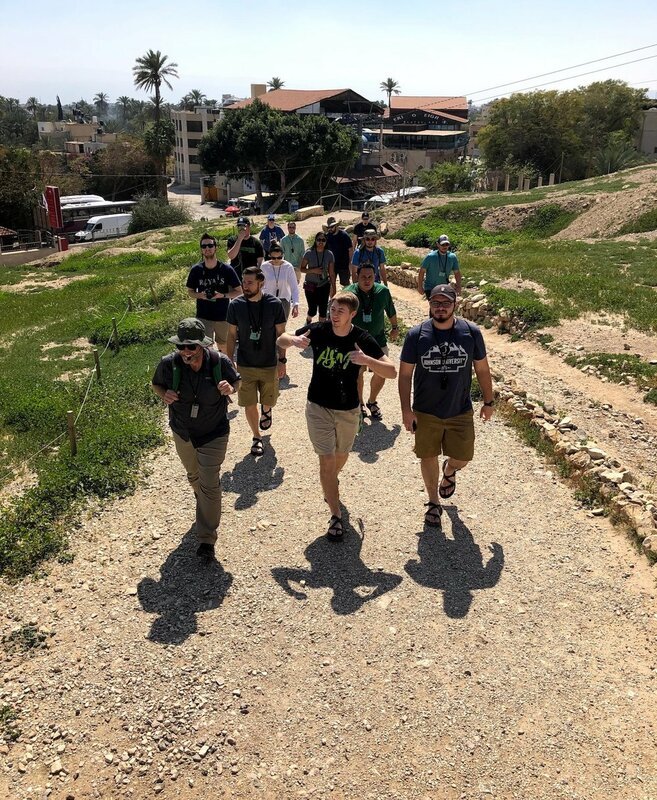 The path they are following is often called the “dry” tunnel to distinguish it from Hezekiah’s Tunnel or the “wet” tunnel. It is likely that this underground passage was cut through the limestone beneath Old Jerusalem in the Middle Bronze Age (ca. 1800 BC). It was used to transport irrigation water from the Gihon spring to fields in the Kidron Valley.